Ringadoc has a pretty big vision: To be the “frontline of primary care,” to let anyone and everyone pay a flat fee to instantly talk to a real doctor at any hour of the day. In pursuit of perfecting on-demand medicine, the startup announced today that it has raised $1.2 million in seed financing, led by Founders Fund’s seed vehicle, FF Angel. The raise marks the close of the second half of its seed funding, following the $750K the startup announced last June from Founders Fund, bringing its total to just over $1.2 million. Ringadoc Founder Jordan Michaels tells us that, initially, the company set out on a straightforward trajectory — providing on-demand service for people to reach a doctor at any time — however, they soon learned that this was something that doctors themselves wanted to give to their own patients. So, the Ringadoc team decided to build it. And, after an extended private beta trial, the team is launching Ringadoc Exchange this afternoon to let doctors triage their own calls from their iPhone or Android. The new Exchange platform enables doctors to more easily follow up with their patients, removing the need to continue paying for an expensive operator-based answering service. According to Michaels, the service is free for three months and then costs $50/month thereafter. Eventually, Ringadoc wants to allow doctors to charge patients for the calls or take calls from outside their own patient pool as well, features that will be coming their way in the next quarter. Michaels says that they want to allow doctors to get paid for some calls they’re doing with their own patients and offer a “premium” level of service and availability to their existing patients for a fee. The goal, while it may seem pedestrian, is an important one. Waiting in line at the doctor’s office, or waiting by the phone for your doctor to return a phone call about a diagnosis or an appointment, can be extremely frustrating. 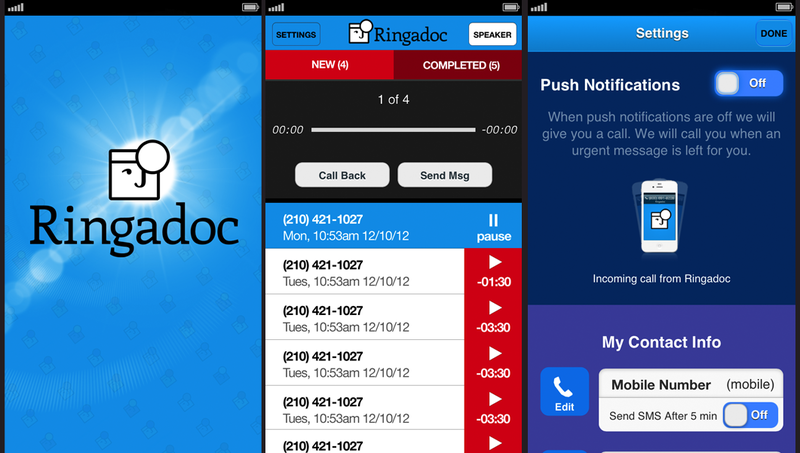 Ringadoc wants to give doctors the ability to respond more efficiently to their patients — whenever and however they want — in turn, ending the cycle of unreturned calls, and relieving pissed off patients and overworked staffers. Today, Ringadoc covers more than 500,000 patients in over 20 states in the U.S. through its platform — a number the team hopes to expand upon with its new round of seed financing. Traditionally, doctors have had to deal with 1970s-style technology to handle after-hours calls from patients. But the penetration of mobile technology has changed our everyday behavior to the point where we now expect the same ease of access and availability from our doctors. Ringadoc wants to prove to the medical community that adapting to this on-demand world can actually make their lives easier, rather than the alternative. The app allows doctors to control and handle patient calls on their own schedule right from their smart phone, responding to patients directly rather than requiring them to go through an operator. The app, along with the platform itself, was built with the support of Practice Fusion — the well-funded startup which offers a free, web-based Electronic Medical Records system that includes charting, ePrescribing, billing, support and scheduling for doctors and patients. Practice Fusion founder and CEO Ryan Howard currently serves on the startup’s board of directors and was one of its first investors. With its new funding in tow, Ringadoc plans to develop the ability for doctors to provide cross-coverage care and premium access to paying patients, while moving to uncover ways for medical practices to access alternative revenue streams. The app is currently available on the App Store and Google Play. For more on Ringadoc, check out Josh’s in-depth coverage here.